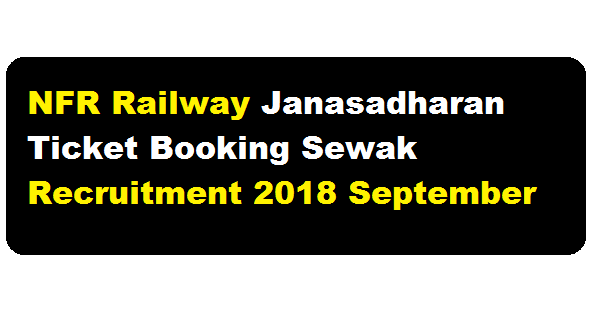 NFR Railway Janasadharan Ticket Booking Sewak Recruitment 2018 September : – Northeast Frontier Railway has published a recruitment notification in the month of September 2018. According to the NFR Latest Recruitment 2018 September, (No. : CM/WP/UTS/JTBS/TSK) Applications are invited for appointment of Janasadharan Ticket Booking Sewak (JTBS) 01 (One) counter in each station mentioned below. In this section, we will discuss in detail about Recruitment of Janasadharan Ticket Booking Sewak post under NFR Railway. 7/ Serving Stations : Makum Jn. Note : Among the reserved categories, 10% will be allotted to the *FF-Freedom Fighter, *WWW-Women War Widow, *WRE-Widow of Railway Employee of said reserved category. Application forms can be obtained from the office of the Divisional Commercial Manager, Tinsukia. Application forms can be submitted, dropped in the box kept in the office of the Divisional Railway Manager (Commercial), Tinsukia from 10.00 hrs. of 17-09-2018 to 17.00 hrs. of 08-10-2018 on all working days and will be opened of 11.00 hrs. of 09-10-2018 in the chamber of Assistant Commercia Manager, Tinsukia. Application forms can be obtained from the office of the Divisional Commercial Manager, Tinsukia.